Sipping on a warm cup of tea is not just something to do on a rainy Sunday afternoon, although that is delightful. Tea is my beverage of choice all year round, any time of day, icy cold or hand-warming hot. And I feel OK about indulging because the health benefits are well-established, the calories are pretty much non-existent, and the flavor possibilities are endless. 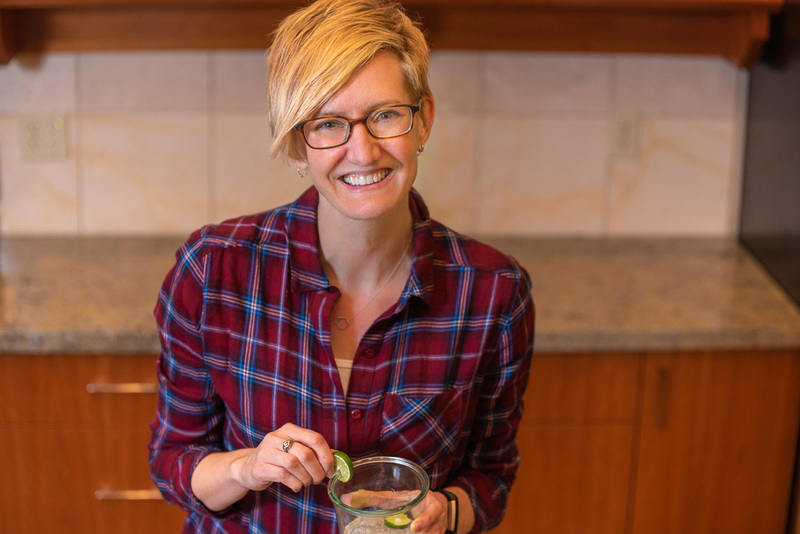 I recently attended the International Food Blogger’s Conference (IFBC) for the fourth September in a row. One of the highlights is always the pre-conference excursions (grown-up field trips) to local food-related companies or producers. 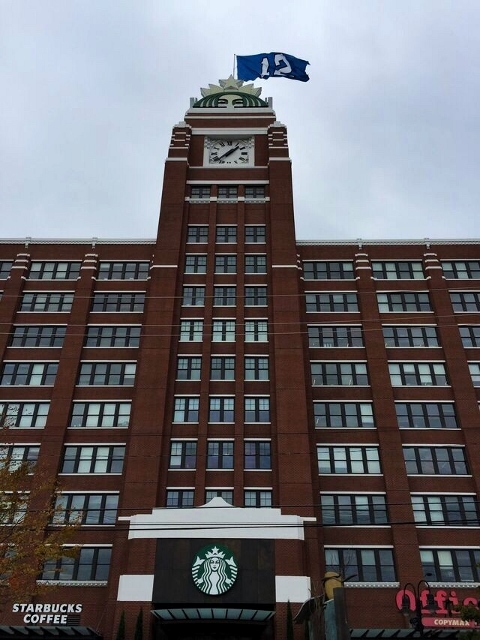 In the past I’ve toured Bob’s Red Mill near Portland and Sur La Table in Seattle, but this year I bumped along on a bus with 20 or so other bloggers to Teavana, which just happens to be housed inside the enormous Starbucks headquarters in the SoDo district of Seattle. 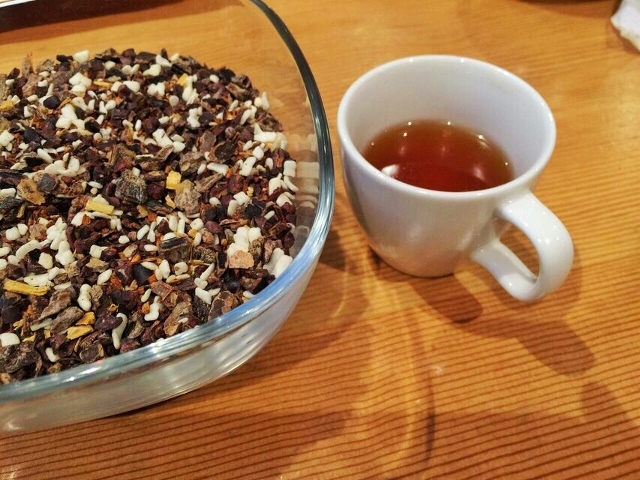 I tasted a lot of tea and I learned quite a few new things about my favorite beverage during our visit, so I wanted to share a little bit of my experience. You might be interested to know, for example, that all teas (white, green, oolong, and black) come from the same plant: Camellia sinensis. 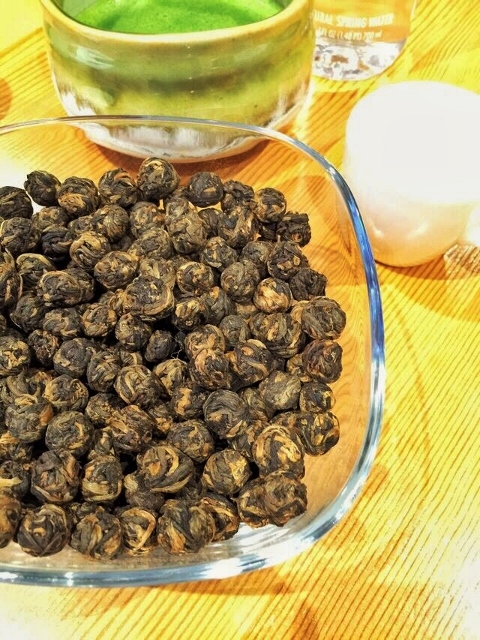 They just undergo different levels of preparation before we steep and sip them, including various stages of drying, steaming, rolling, shaking, bruising, fermenting, and oxidizing. And they all have individual recommendations for the amount of leaves to use per cup, steeping time, and preferred water temperature. Apparently a perfect cup of tea is in the details. 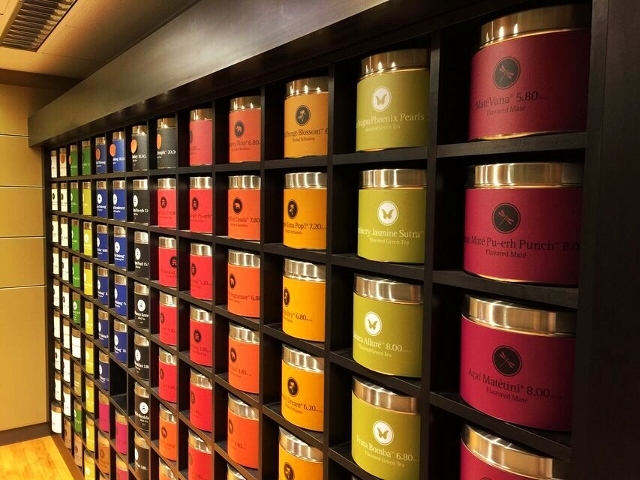 Upon our arrival, we were greeted by a colorful wall of tea. 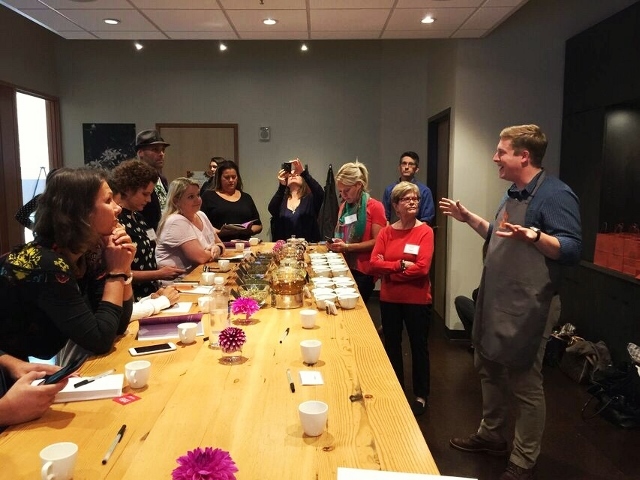 Our tea experts instructed us to pay attention to how the dry and wet tea leaves look, notice the color of the tea in the cup, and spend time appreciating the aroma of the tea all before actually tasting it. Then we were ready to taste tea like the experts do it: slurp the hot stuff while sucking in air, and swishing a lot as we note the flavors at the beginning, middle, and end of the mouthful. 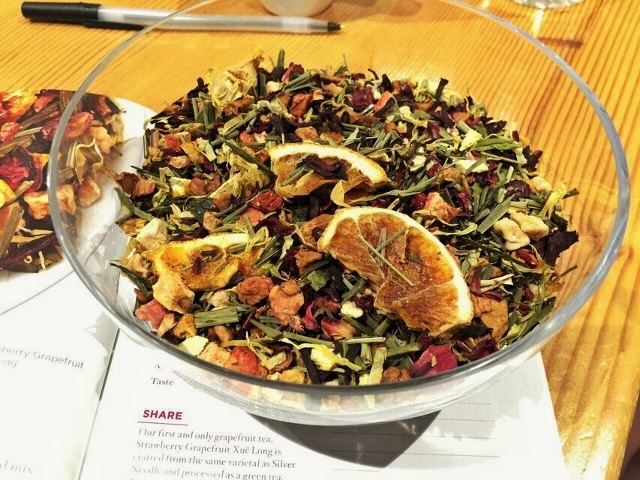 Another interesting tidbit: catechins, a type of phytochemical (plant chemical), in tea are likely responsible for the different flavor profiles and the health benefits offered by this versatile beverage. I’ll take you through the steps in the order we tasted, from least to most oxidized. 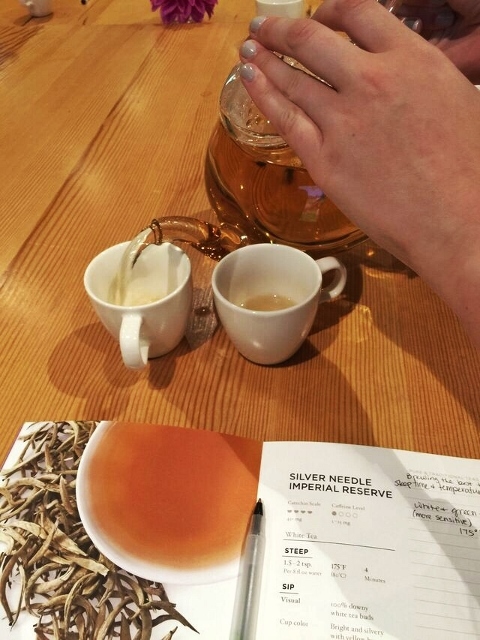 We started with white tea, specifically Teavana’s Silver Needle Imperial Reserve. I thought the leaves were absolutely gorgeous. (You can see them pictured in the booklet in my photo below. I’d updated the iOS software that morning and my iPhone’s camera had started being finicky about focusing. Hence, no good picture of the actual leaves. And varying levels of successful focusing in the remaining pictures for this post…) The caffeine level is lower for white tea (< 15 mg per 8 oz. cup) and it’s often considered the most subtle tasting of teas. 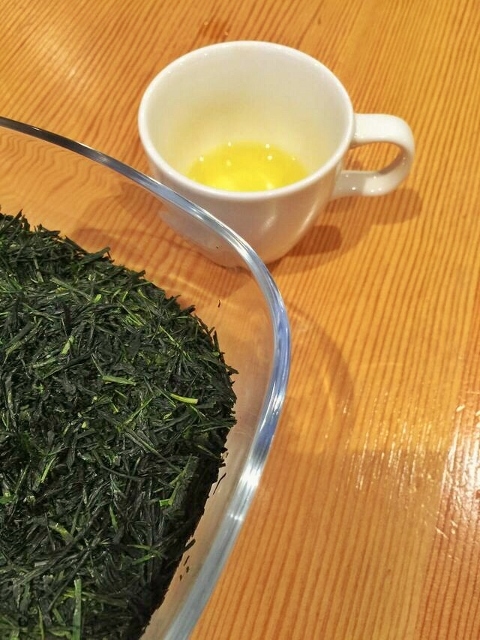 Next up was the Gyokuro Imperial Reserve green tea, the most popular green tea they sell. At the risk of sounding like a wine snob, my tongue got a pleasant almost seaweedy flavor, and the aroma was buttery and grassy. Just the thing to get my taste buds going first thing in the morning. White and green teas are more “sensitive” so generally do best with 175º water instead of a full-on boil. 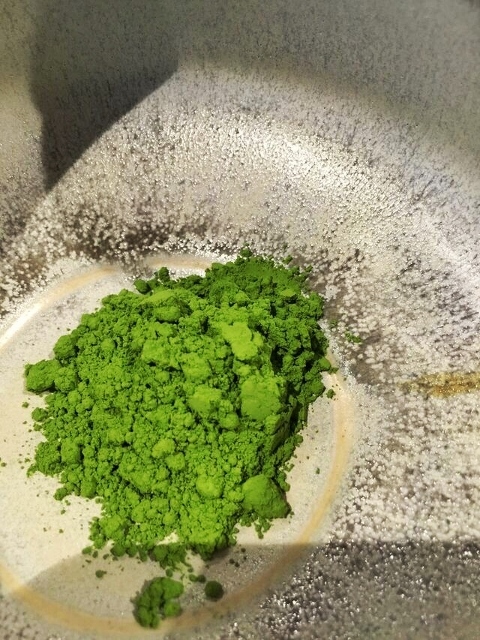 We prepared the most trendy tea next: matcha. You know you’ve seen it everywhere, in smoothies, cocktails, and cookies. It’s actually stone ground green tea powder and it’s unique because instead of drinking an infusion of the tea, you actually ingest the tea leaves. The caffeine level is high (>41 mg per 8 oz. 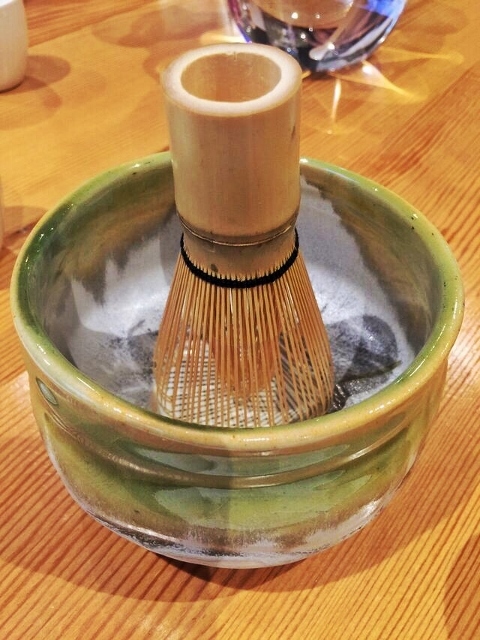 cup) and the unique preparation technique of dissolving with room temperature water in a special bowl (called a chasen) using a bamboo whisk is a special morning ritual for many tea lovers. 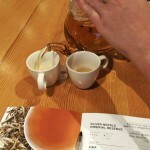 My favorite teas of the day were the black teas (or so I thought…see below). I loved both the Black Dragon Pearls (from China) and the Darjeeling de Triomphe (from India) with their crisp, strong flavors. If you are brewing black tea at home, the recommendation is to use water at 205º. Similar to green tea, the caffeine runs high (>40 mg per 8 oz. cup) and it stands up well to sweetener and milk, so it makes a nice alternative to coffee. After the black teas we sampled a flavored green tea called Strawberry Grapefruit Xuê Long, which smelled fantastic with its freeze-dried strawberries, apple pieces, and hibiscus. Not surprisingly, it makes a great iced tea. And then we came to the herbal infusions, and I fell completely in love with the White Chocolate Peppermint tea. There’s no actual Camellia sinensis in it, just carob, cocoa nibs, licorice root, peppermint oil, vanilla, pieces of white chocolate, and some other stuff I couldn’t write down fast enough. They passed around a bowl of it so we could all enjoy the aroma and appearance. I couldn’t stop smelling it. I’m pretty sure I went past some socially-acceptable threshold for keeping my nose in the bowl and making the blogger next to me a little weirded out. I’m telling you, it smelled so incredible I’m tempted to put a bowl of it out at Christmas and call it potpourri. The good news is that it tastes like a wonderfully indulgent treat, but it’s pretty harmless, even if you go wild and have 3 cups. The bad news is that it’s a seasonal holiday tea and won’t be available until October 19. I’m thinking when I get my hands on some it might make a nice London Fog-style drink, mixed with a little sweetener and warm non-dairy milk on a cold December day. I’ve actually got a reminder set on my phone to pop up on October 19 so I can order it. It’s that good. Probably the only drawback to this wonderfully healthy, versatile, low calorie, tasty drink is that loose tea is shockingly expensive. On Teavana’s site just 2 ounces of my preferred Darjeeling de Triomphe is $19.98. I usually make a 16 fluid ounce cup in the morning, which uses 0.1 ounce of tea leaves, which would work out to about $1.00 per day. For the herbal teas, like their CocoCaramel Sea Salt, it’s just $7.98 for 2 ounces but I use 0.4 ounces to make a large steaming mug in the morning, costing $1.60 per day. I don’t know how that compares to coffee. It’s certainly cheaper than a fancy drink from a coffee shop drive-thru, but still seems pricey. Guess I’ll consider it an investment in my health. Since visiting Teavana, I’ve taken my tea routine to the next level. I’m measuring out the loose tea leaves with precision, taking the temperature of my tea water, tracking my steeping with a timer, and sipping with a little more appreciation. Our tour leader told us there are 3,000 different types of tea so I feel sure you could find at least one that could make your morning a little brighter, your afternoon a little sweeter, or your bedtime a little steamier. Do you have a teatime habit? Or a favorite way to enjoy this leafy drink? 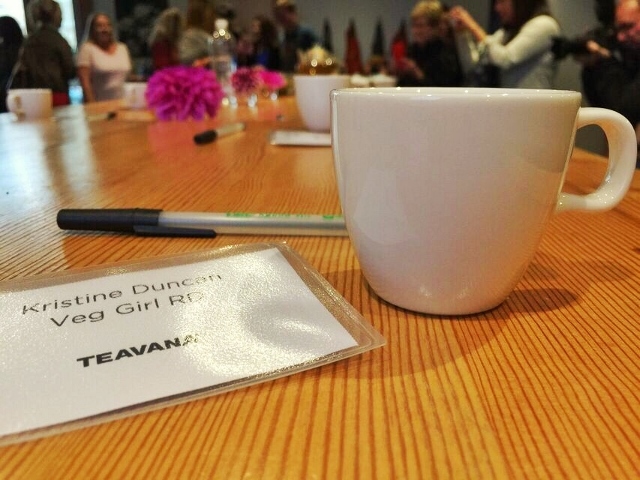 Disclaimer: As a conference attendee I was given some free tea swag from Teavana but I don’t have any relationship with their company and didn’t receive any monetary compensation for this post. And, while I regularly write about tea anyway (like here, here, and here) I did get a discounted registration fee for agreeing to blog about the conference.